Manikanth Kadri is an Indian film score and soundtrack composer and singer. He has predominantly scored music for Kannada as well as several Telugu,Tamil and Malayalam films. 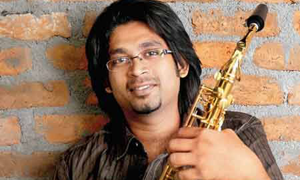 He is the son of legendary saxophonist Kadri Gopalnath. Manikanth started out his career by composing for over 500 jingles and devotional albums. He also composed for a title track of a Malayalam tele-serial Annu Mazhayayirunnu and won the Kerala State Award for best music. He released his first instrumental album called Dream Journey in the year 2001 and also tasted success. He also scored for background for an English feature film Tantric Journal. His film musical career began with Smart City (Malayalam) and Mr. Garagasa (Kannada), at the age of 24. After these films, his major break through happened with the Kannada film Savari in 2009. He has scored music for various films in Telugu, Malayalam, Kannada and Tamil languages.